If you have a narcissist in your life, you have probably found yourself asking these two questions over and over again! The fact is, it isn’t you at all. And it will take time and effort for you to realize that. Narcissism is a personality disorder that is characterized by an excessive need for attention and admiration from others. By nature, a narcissist doesn’t care about anyone but themselves. But over time, they always show their true colors. The mask gets ripped off! What first appeared to be good character qualities turns to total self-obsession. The red flags usually start showing in things that they say to you. However, their words are intentional and they have a purpose. (Read about it here). 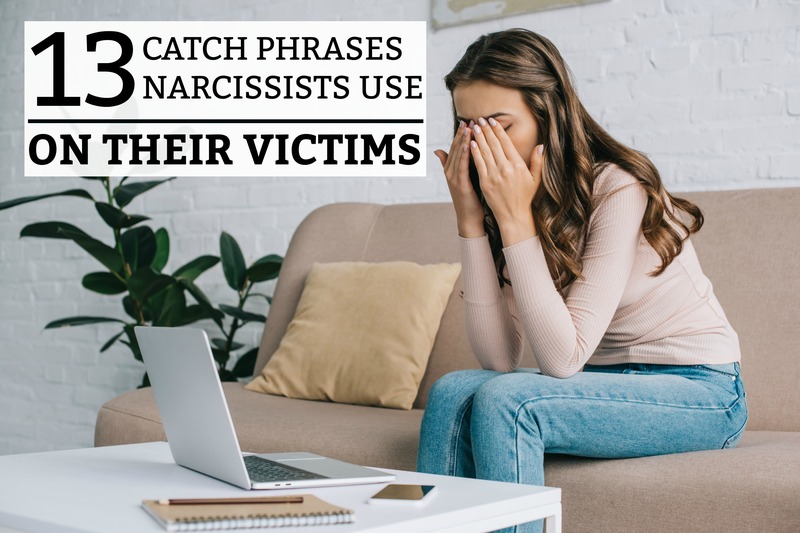 Below are 15 catch phrases that narcissists use on their victims. If you try to confront a narcissist on something hurtful that they said, they will immediately deny it! Why? Because they cannot look bad in front of others and they cannot place blame on themselves. They have no problem with lying – if it makes them look like the victim! They LOVE to look like the innocent victim who’s good character is being smeared for no reason. The problem with this is that NORMAL people tend to question themselves when someone blatantly denies their allegations. They want their conscience to be clear. A narcissist HATES being figured out. When they realize that they can’t use you anymore, they accuse you of being the “bad guy”. If this is said to you, take it as a compliment! In their mind, they are supposed to be your priority. You exist to make them feel good about themselves. If you confront their toxic behavior, you’re the one with the problem! If the narcissist apologizes, it isn’t an apology! Their apologies come in the form of sarcasm, putting the blame on you, or actually lying to get you back into their life. The goal of any “apology” is to make the argument go away, so they can continue using you as a source of narcissistic supply. They aren’t sorry for what they did. They’re sorry that they got caught! Your opinions and emotions don’t matter to them because they aren’t valid. All that matters is how the circumstances affect THEMSELVES. Guilt-tripping is an art-form to the narcissist. It’s a favorite tactic for them to use when someone is confronting them or distancing themselves from them. The unfortunate thing is, it is a very successful tactic! Why? Because it plays on the emotions and kindness of normal human beings. Whether the narcissist is a spouse, friend, parent, or child – they will find a way to blame you for being selfish and ungrateful. Unfortunately for the narcissist, no amount of good deeds can cover up the habits of a toxic, jealous, narcissistic person. In fact, this tactic exposes who they really are! It shows that everything they did for you was not done out of a heart of unconditional love. They are trying to take the blame off of themselves and put it on you. If you are in a group setting confronting their behavior, this tactic might work because they can try to character assassinate you in front of other people – and make you look like the awful person. The narcissist will do anything it takes to get the uncomfortable situation to go away. They will “rabbit trail” conversations and talk about all the good things they have done – instead of accepting fault for the bad things. Anything to keep up the facade! Once again with the emotional manipulation! Your “figuring the out” or trying to distance yourself from their toxic behavior is effecting their health! They’ll say anything to make you feel guilty for standing up for what you know is right. In their own minds, people adore them! Often, they’re incapable of seeing reality for what it truly is. People might really like them, but then they figure them out – and the narcissist is always left alone in the end. Any relationships that they can maintain are with people who are emotionally weak, dependent on them, or have a distant relationship with them. The closer they get to someone, the more toxic things become! Sadly, they will say or do anything to avoid acknowledging that they lack self-confidence and have crippling insecurity issues. Keeping up the facade is very very important to them. This is why it is YOUR FAULT! Everyone loves them but you. And they have “no idea” why you are bitter or jealous at them. In reality, you just want them to acknowledge their toxic behavior and change. Unfortunately, this is almost impossible. In reality, the narcissist meant exactly what they said and they’re glad that you caught that. But they can’t take the fall for it. So, they’re going to make you second-guess yourself and feel like you might be a little bit crazy! They’re goal is to emotionally invalidate you, so you’ll stay compliant to their goals and wishes. They want you to continue to rationalize and minimize their toxic behavior, so you can continue to be a prime source of narcissistic supply! They will always have more experience than you. They will know more important people than you do. Your opinion doesn’t matter because there’s is always more valuable. If you have a narcissist in your life, you’d better get use to this behavior! They will always be the subject-matter-expert when it comes to every topic of conversation. And if they feel ill-equipped to talk about something, they’ll change the subject to something they know about. When someone changes the conversation, the narcissist is quick to interrupt (even mid-sentence), so they can turn the attention back onto themselves. In some ways, their actions seem childish. They are actually annoyed by people’s desire to have an equal, two-way conversation. Unfortunately, this character quality drives people away from them very quickly. The narcissist loves to triangulate relationships! They’ll even create a situation where they make someone feel like they don’t have their full attention because someone else is replacing them in their lives. When you ask them why you are hurting them so badly, they’ll accuse you of being jealous, selfish, and insecure! They’ll do this to their romantic partner, child, or other family members. The goal is to make the other person jealous, so they’ll do whatever it takes to keep the relationship alive. The more diminished and replaceable you feel, the less likely you are to leave their toxic grasp. Some of this might actually be true! Many narcissists do have difficult childhoods and bad memories from their past. But they will always use this as an excuse for their toxic behavior. When you bring up something they have done wrong, they’ll talk about the impact that their difficult past has on their current situation. Then you’ll feel guilty for reminding them of the difficulty they have faced in life. Their point would be valid if they didn’t over-use it as an excuse to get away with manipulation and destructive behavior. They’re opinion is all you need! That’s how they want your relationship to work. Once they get to know you, they volunteer their opinion without being asked. They truly believe that their opinion is welcomed and necessary in your life. Often, they’ll ask follow-up questions that invade your privacy. If you don’t answer the way they want, they will get offended – and you’ll pay for it. Another favorite tactic of the narcissist is the “Silent Treatment”! Usually, the purpose of this behavior is to teach you a lesson! I just finally finished with a female 60 year old Narcissist.